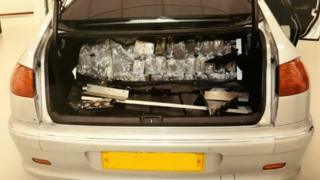 Six men have been arrested during a police crack down on the importation of drugs to the Isle of Man. Police said Class A and B drugs valued at £1m had been seized since January 2018 along with "significant cash". Four men from Merseyside aged 39, 34, 33 and 32 and two men from the island aged 28 and 31 have been arrested for being concerned in the production of controlled drugs. Police said no further comments would be made while the inquiry continued. A police spokesman said three of the men had been arrested in the UK and three on the Isle of Man within the past 48 hours. All are currently being questioned in relation to the alleged offences. Det Insp Juan Kinley said: "We will be relentless in our pursuit of those in the UK, particularly in Merseyside, who seek to import drugs to our island." The men were arrested by officers from the island's Drug and Organised Crime Unit as part of an ongoing operation with Merseyside Police. Police said some vehicles had also been seized.